The Iraqi cabinet has agreed a draft law to restrict smoking in public places and ban tobacco advertising, a government spokesman has said. If the law is approved by parliament, smoking would be banned in all government and public sector buildings. It would also be outlawed in theatres, clubs, offices and on the public transport network. Smoking is widespread in Iraq and it is unclear whether the ban will apply to cafes, bars and restaurants. "The purpose behind approving the draft law to fight smoking is to protect the people from the social, health, environmental and economic risks of smoking," said government spokesman Ali al-Dabbagh in a statement. The bill would also ban the sale of cigarettes to anyone under the age of 18 and fine anyone who is caught selling them to young people 5 million Iraqi dinars ($4,300; £2560). 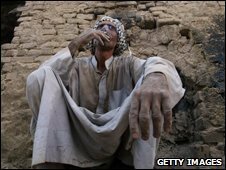 Baghdad resident Mohammed Hussein, 45, an oil ministry worker who has smoked for 25 years, told the Associated Press news agency that banning smoking should not be a priority. "The smoking law is not as important as many other laws with a higher priority for Iraqis." The draft bill would need to be approved by parliament which is in recess until September. The World Health Organization estimates that more than 41% of Iraqi men and nearly 7% of women are smokers.